Rollin' down the river with Proud Mary and her krazy krewe! 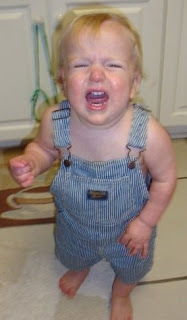 : Holy Tantrum Tuesday! Wow, Noah must have woken up on the wrong side of the crib. He was such a crab this morning. While I get ready for work I always put on one of his shows (either Yo Gabba Gabba or Toy Story) so I can have some peace while I put on my makeup and do my hair. This morning I decided to feed into his Toy Story obsession and let him watch a good 20 minutes of it while I got ready. Once I was ready I told Noah it was time to go and he flipped out. He got irate and started screaming and throwing himself on the ground. "NO, YOU stop it! YOU stop it!" he screamed while I begged him to please go to the car. He carried on for a few more seconds before I started to lose my patience. "Please Noah, Mommy will let you listen to the Movers in the car" I said...oh he didn't care he just began screaming and losing it even more. So there I am standing there holding his Buzz and Woody, my purse and a drink in my hands. I begged him once last time and he ran into his room. I went into his room and asked him to come on and he threw himself on his chair and said "NO!!!!". I felt the only way I was going to get out of the house and to work on time was to actually pick him up and bring him to the car. So, the cat and mouse adventure began! I reached down to pull him off the chair and he leaned forward to me and slapped me right across my face. Nice! My patience was non existent at this point obviously. Since I was stunned and shocked by the slap he had time to escape! He then ran into the living room. I ran closely after him and saw him on one side of the room. I ran to that side and then he ran back to his room. We did this whole cat and mouse routine for a good 3x before I really blew my top. Know when you walk by someones house and you hear someone yell at their kids and think "Oh gosh, what a terrible mother!"? Well that was me around 7:45AM. I tried to do a stern tone while I yelled at Noah to PLEASE go to the car. He was scared/shocked by my scary tone. He didn't buy it at all. So I then picked him up and headed out the door to the car. Then he began telling me I was the "mean mommy" and was crying for his Da-da as I was buckling him in his car seat. The crying for Da-da and the mean mommy comments lasted the whole time in the car through the Starbucks line and till my parents house. Oh how much fun you can have before a work day begins! Just for your viewing enjoyment and you can see how Noah is during a tantrum, see below. This is a picture of him last summer (around 18 months) when he was losing it! Wow!!! I definitely know where you are coming from with this kind of morning. Haha. Travis has had a few mornings like that. It really takes everything in you to not lose it. And... dont feel bad. You are a good mom. He was just mad in the heat of the moment!